When it’s pouring with rain, Gogo decides to pass the time by making some pancakes. But she soon discovers that the family has run out of three important ingredients: flour, eggs and milk. Without those, you can’t make pancakes. But clever Gogo has an idea. She sends Lungi and Sipho to a different neighbour to borrow what they need, and to take each of them a gift of lemons from the family’s lemon tree in return. And so, due to the kindness of the neighbours, Gogo and the eager children are finally able to make the pancakes. 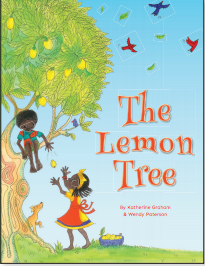 In The Lemon Tree, nominated for the prestigious Golden Baobab Prize in 2014, author Katherine Graham tells a simple, moral story with charm and an ability to transport the young reader evocatively into the moment. The story is beautifully illustrated by Wendy Paterson.